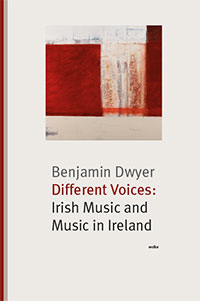 This web site, which was produced by the Contemporary Music Centre, provide additional materials and information on the composers featured in the book, Different Voices: Irish Music and Music in Ireland by Benjamin Dwyer. Published in 2014 by Wolke Verlag, Different Voices: Irish Music and Music in Ireland provides new insight into contemporary music in Ireland. Through twelve interviews with Irish or Ireland-based composers ranging in age from 26 to 80, the book delves into the compositional and stylistic eclecticism of Irish music. In the Introduction, Benjamin Dwyer overviews music in Ireland from 1700 to the present, exploring how significant historical and socio-political factors such as English colonialism, Irish nationalism, religious and state censorship and globalisation have shaped the trajectory of Irish music. The interviews raise themes central to the study of Irish music such as the relationship between European and ethnic music traditions, music styles and practices, the notion of “Irish” identity, music’s role in society, the role of politics, particularly feminism, and the reception of contemporary music in current Irish and international media. Different Voices: Irish Music and Music in Ireland breaks new ground in the study of contemporary music from Ireland, an important aspect of European culture still largely unexplored. The book is available to order direct from Wolke Verlag’s web site, price €29.